Ralf Mielke; Friedrich Goldmann; Thomas Müller; u.a. 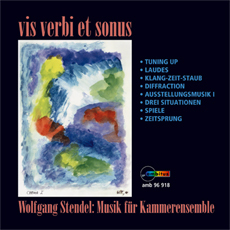 Wolfgang Stendel's compositorical approach is distinguished by a serious thoughtfulness and an imaginative, consequent working through of the musical material. In his compositions, linear and vertical structures (scales and sounds) and a polyphonic network are fundamental. A key role thereby is played by form calculi, the organisation of tone complexities, metres, elements of movement, sound density, single tone spectra and tone colour in musically individual possibilities of expression. His relationship to literature and philosophy is not only to be found in his instrumental music, but also is expressed in various vocal compositions.